Iran houses some of the world’s most stunning scenery, and Badab-e Surt—also known as Badab Soort—is no exception. Around sixty miles south of Sari, this natural wonder is a range of stepped hot spring terraces. 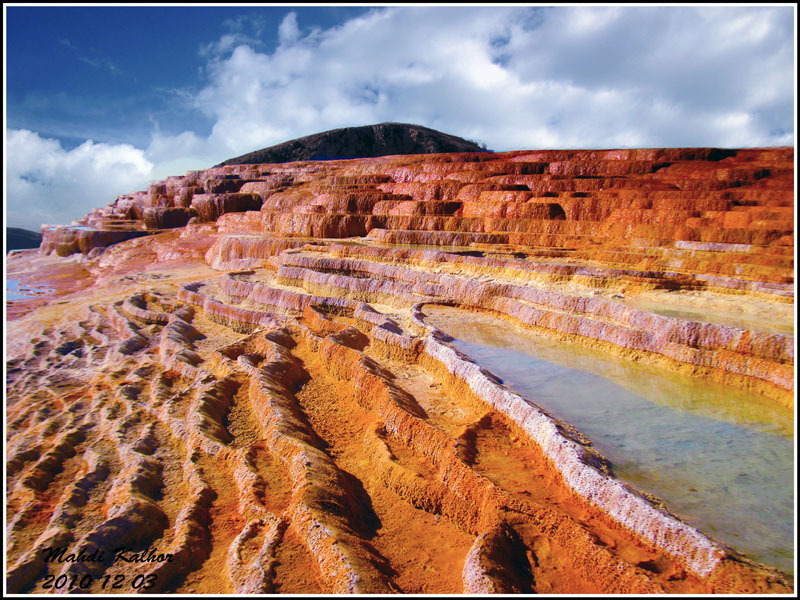 Created over thousands of years from the hot, flowing mineral water, these travertine terraces are stained red from iron carbonate. If you’ve heard of southern Turkey’s Pamukkale, think of Badab-e Surt as the more colorful and remote cousin. Sitting more than 6,000 feet above sea level, two distinct mineral springs—with different characteristics—comprise Badab-e Surt. One spring’s water is very salty, gathering in small natural pools. The high salt content is believed to give the water medicinal qualities, curing rheumatism and some forms of skin conditions. The other spring is said to have a sour taste and is predominantly orange. The color variation is due to the quantity of iron oxide sediment. Unfortunately, Badab-e Surt is not very accessible. It sits around 230 miles from Tehran, which contains the closest airport. However, many tour agencies provide transportation to Orost—the closest village to Badab-e Surt. The Semnan route passes through Samnan city, and the Mazandaran route passes through Sari and the forests around Kiasar. We recommend staying overnight in Orost; the terraces are just over an hour’s walk from the village. Additionally, traveling in Iran may pose its own speedbumps. Though a burgeoning tourism industry is developing among warming relations, visitors must adhere to a set of social rules. Obtaining an Iranian visa is a notably difficult task, and all travelers must be granted an Authorization Code prior to visa application. However, if you are up to the challenge of securing the clearance necessary to travel to this beautiful country, it will be well-worth the effort.